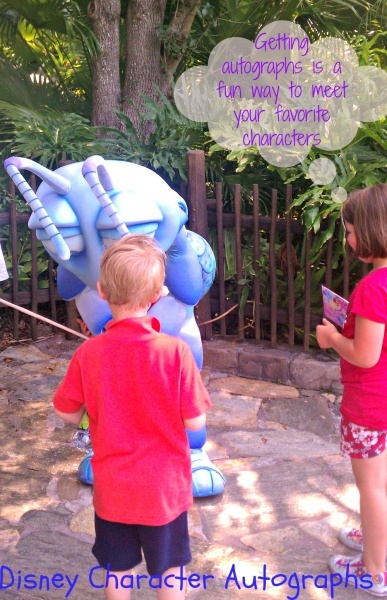 Character Autographs are a MUST at Disney! The first time I went to Disney World, I had a bit of culture shock. It was a high school trip. I didn’t really plan much, didn’t research the parks, and when I saw people carrying autograph books for characters, I thought that was the silliest thing I had ever seen. Why in the world would they want a pretend person to sign a fake name in a book??? But I know now I was completely missing the point. As an adult, I realize we go to the Disney parks for one reason only. We all take a trip to Disney to escape reality. Part of that escape is doing things we might find silly at home. You probably wouldn’t take an autograph book with you to work for your co-workers to sign, and I’ve never met anyone that takes one to the grocery store for the cashier. 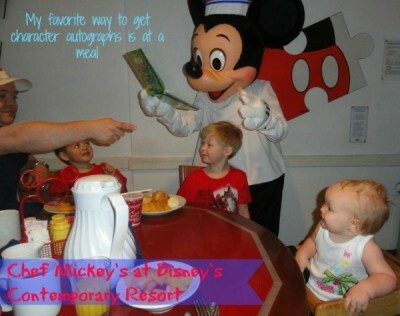 But why wouldn’t we want an autograph from your favorite movie star? The Disney parks have made it so simple for us to do just that. They have set up character meet and greets with so many of the Disney characters we all know and love. Whether you want to meet Cinderella, Mickey Mouse, or even Jack Skellington, Disney has you covered. Disney keeps many of the fan favorites in the parks year-round. Then they host special events throughout the year to bring out assorted villains and other characters that might not be seen on a daily basis. The meet and greets are set up in all of the Disney parks. Times can be found daily in the Times & Events Guide at the park or you can check in with Guest Relations when you arrive for the most up to date information. You can even find character greeting times on the Disney Cruise Line ships. These are your standard meet and greets. You show up at the scheduled time and wait in line. In addition, there are even some characters that you can get a FastPass for and not have to wait as long in the parks. 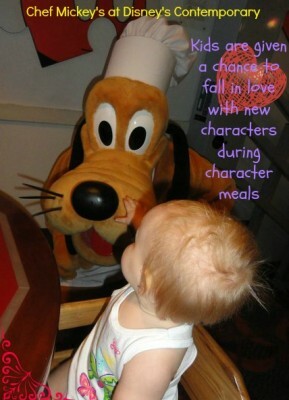 My absolute favorite way to meet characters is actually over a scrumptious meal. 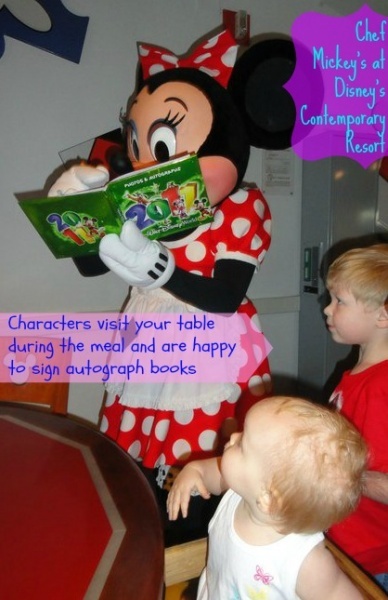 Disney has set up many fabulous character meals where not only do you get to meet your favorite characters, but they actually come to your table to visit you instead of having to stand in a long line. 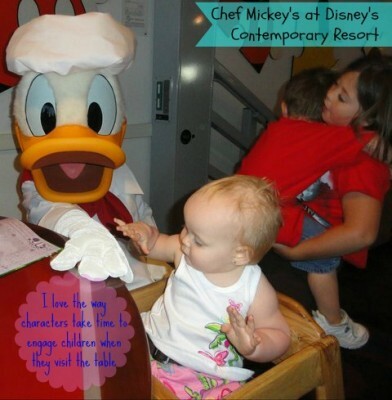 A favorite meal for our family is the buffet at Chef Mickey’s inside Disney’s Contemporary Resort. 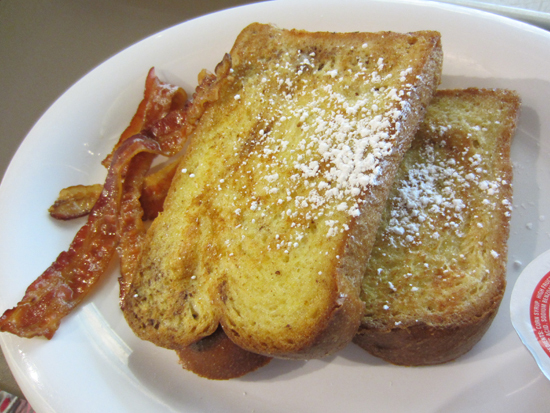 Each meal has several characters to enjoy. They visit your table one at a time, so you can get a chance to talk to each one. They will pose for pictures and sign autograph books. I think the character meals add a more personal touch to meeting the characters. I have found that each character interacts with every person at the table. Not only do they pose for pictures and sign their names, they make sure you have fun while they are there. I love that! You also tend to get a longer interaction than you would get if you had done a regular meet & greet. The thing I enjoy most about meeting the characters and getting autographs is seeing my child’s face when they meet someone they’ve seen on screen. It is such a special moment. But even if they have never seen the movies, like my youngest on our last trip, it gives them a chance to fall in love with the characters in person. Above all, have fun! When you look back at your autograph books later, you will always remember those beautiful memories you made meeting all your favorite characters.